[AUTO](RC):At the end of the battle it attacked, if your opponent’s vanguard is deleted, COST [put six rear-guards and cards from your hand in total into the drop zone], [Stand] your vanguard, and it gets drive -1 until end of turn. 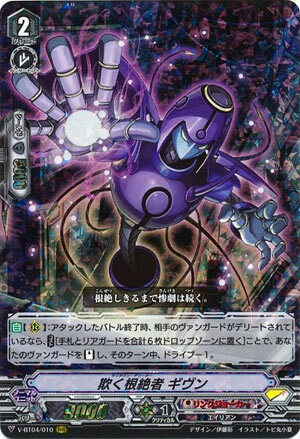 So this is basically the main finisher for Link Joker if somehow the opponent live through a Delete turn normally. -6 sounds hella steep and it is, considering other re-standers, but honestly it had to be this way. -1 Drive is normal, but for a turn that makes those without Sentinels very sad, it makes sense that you’d have a cost this expensive since the -6 can be any combination of field dump or hand dump, so you could just waste almost all your hand instead and still leave your rear-guards free to attack, especially if they have triggers passed to them.